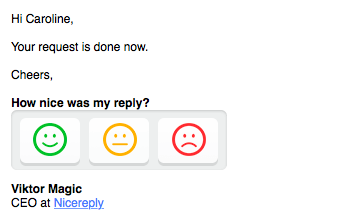 Receiving ratings on your emails is the most important thing when it comes to the purpose of Nicereply. From our experience, we know that you don’t need to be a huge corporation with thousands of solved tickets to receive your ratings often. And in almost all cases the problem dwells in the position of the rating link in an email. A basic mistake is to put the rating on the bottom of signature. The rating link in the picture below is invisible with almost no click through rate.